If you’re in Reno and looking for a new puppy, the Comstock Corgi Rescue right now has two litters that are looking for good homes. It seems that two mothers got knocked up by the same local neighborhood stud at the same time, and both gave birth within days of each other. The little guys are five weeks old right now, and they’ll be ready to go home right around the first of April. 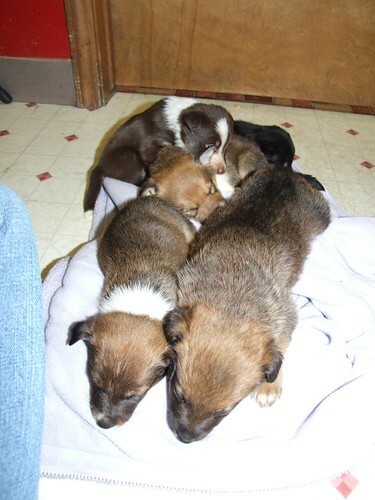 There are twelve puppies all together, but as of Friday there were only five left without homes. The other seven have already been adopted. We’re getting one of the puppies ourselves, so if you go down to visit them, keep your hands off our Baxter! There is an adoption fee of $250 to take home one of the puppies, but this isn’t a puppy mill. They’re not in it to make a profit, they just need to charge money to cover the costs of raising these pups until they’re ready to go home. Any money that’s left over will go towards future rescue operations. 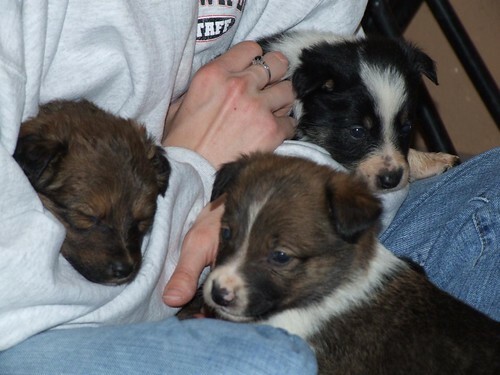 As you can probably tell by the name “Comstock Corgi Rescue”, these are corgi puppies. Actually the mothers are both corgis, and the father was a border collie, so all the puppies are mix of black, white and brown, with short stubby legs and thick coats. Comstock Corgi Rescue is a part of the K-9 Fitness Center in south Reno. It’s located near where McCarran meets Longley, at 5325 Louie Lane #10. (Map it!) The phone number is (775)448-9900, so you can call ahead and make sure the last of these adorable little guys hasn’t been adopted yet. And if you do get one, drop me an e-mail or post in the comments so we can share pictures and keep track of where the various siblings end up going! I’ve got a bunch more pictures from our Friday visit here.